Without a doubt, HTML5 has established itself as the best way to build applications in a multimedia rich world. In so doing it has brought about several huge advancements in web technology. For example, HTML5 provides superior support for vector graphics and interactive online features like file sharing and photo or video editing. It also enables us to stream audio and video files in a web browser without the need for third-party plugins, which thankfully in turn makes connection speeds quicker. With smart devices of varying screen sizes and resolutions saturating the market, HTML5 also enables users to have a better and more consistent web experience across several devices. Developers have responded to all these developments over the years with greater and greater numbers of cool and useful HTML5 projects, all taking advantage of this great technology. Here are the 10 most popular HTML5 projects at CodeCanyon that you really need to know about. Real3D FlipBook jQuery Plugin is definitely right up there in terms of HTML5 projects you need to check out. A favourite at CodeCanyon, the Real3D FlipBook jQuery Plugin enables users to easily create beautiful magazines and brochures with realistic 3D page flip effects. Once users have downloaded the plugin, they can simply customise one of the many available templates and create interactive pages with links, buttons, videos, music players, and so on. Real3D FlipBook jQuery Plugin is a must have for both individuals and businesses who want to display their products and services in a fun and interactive way. 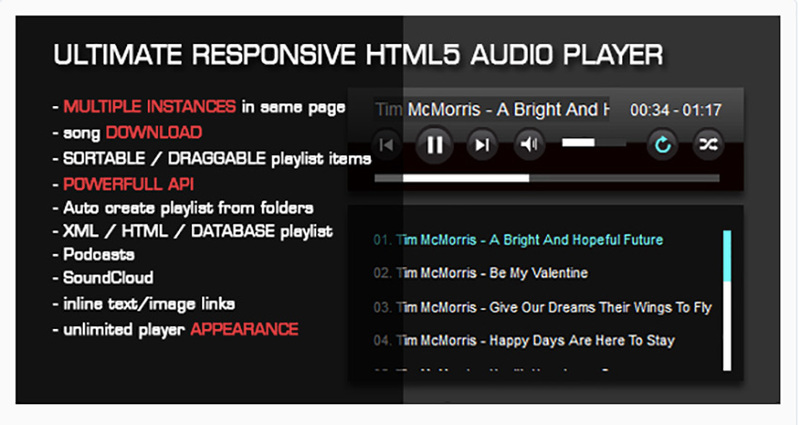 If you’re in the market for an Audio Player, check out the HTML5 Audio Player with Playlist. This audio player gives you several playlist options, including HTML markup, XML playlist, Podcasts, SoundCloud, etc. The download also comes with almost 20 demos to help get your creative juices flowing. As a number one CodeCanyon seller in the HTML5 Projects, HTML5 Audio Player with Playlist is bound to please even the most discernible buyer. You just have to check out the live preview for the HTML5 Responsive Slider Gallery to understand why it’s not just a bestseller here at CodeCanyon but also a candidate for our popular HTML5 projects list. One of the things that makes this slide gallery so appealing is that it will adapt both height and width to any space that you added it to based on the parent container, that is the div or other HTML tag, to create a perfect fit on your webpage. In addition the gallery uses a graphics processing unit (GUP) for peak performance on both your desktop and mobile devices. 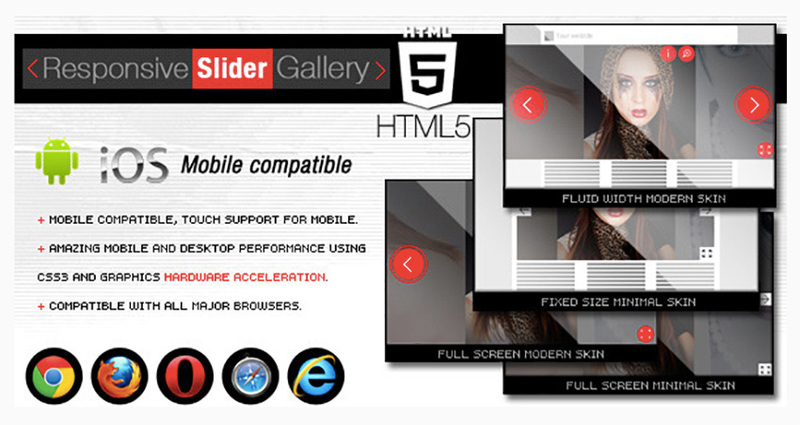 HTML5 Responsive Slider Gallery is a wonderful tool that image rich site owners will want to get to show off their images to their best advantage. 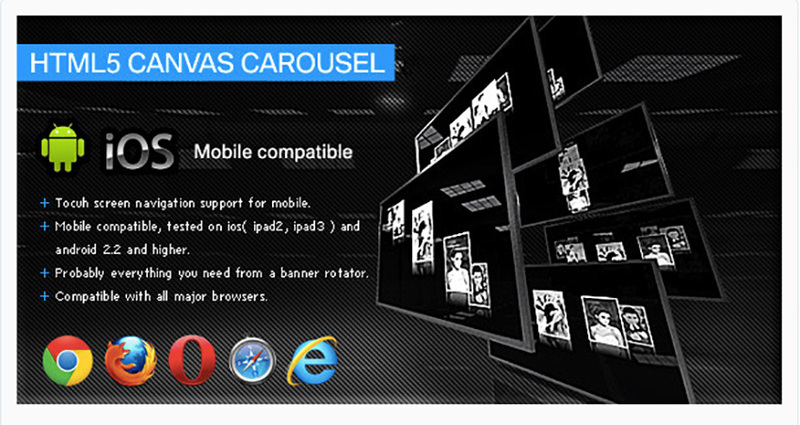 The HTML5 Canvas Carousel gives you another great option to show off your images. The 3D photo gallery in the shape of a carousel gives you six different options for presenting your images. Optimised for both Android and iOS mobile devices, the Carousel is highly customisable, and all options can be modified inside the XML file. The HTML5 Canvas Carousel download file comes with a comprehensive help file explaining all configuration tags and installation. The Interactive World Map With Cities is a pretty cool tool. 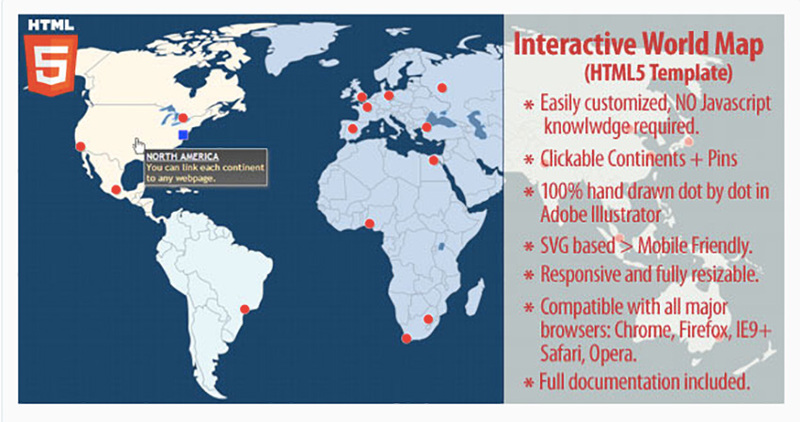 It allows you to create your own custom interactive world map by adding an unlimited number of clickable hotspots anywhere on the map and adding photos, links, and hover descriptions. The map is SVG based so it's responsive, fully resizable, mobile friendly, and cross-browser compatible. The Interactive World Map With Cities is a great tool for those who travel a lot for business or pleasure. Word Search Game is a simple but powerful tool that lets you create and add your own word search puzzles to your website quickly and easily. The game doesn’t require any installation and comes with a comprehensive help file explaining each step for uploading the script and getting the game up and running. 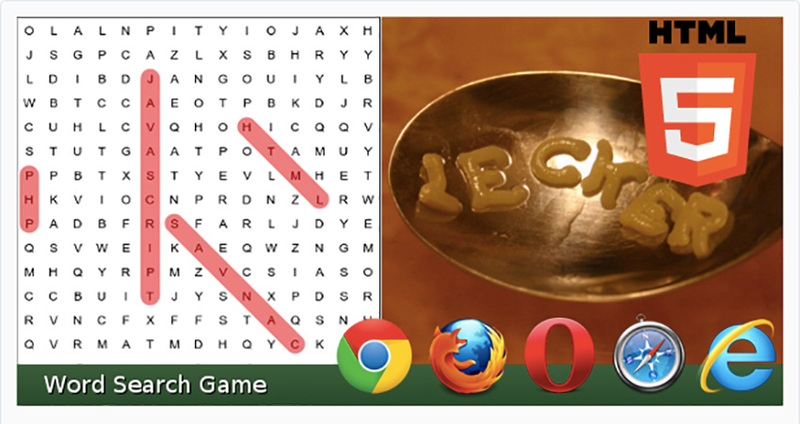 Word Search Game is a great way to keep visitors to your site engaged and entertained. You can try it before you buy it by checking out the live preview. 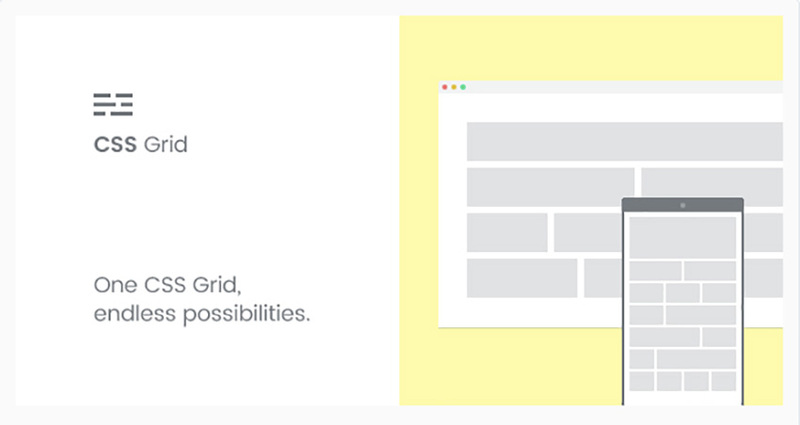 There's no shortage of grid systems for building webpages on the market, but the Responsive HTML5 CSS Grid wins the popular vote for creating a grid that makes it easy to get a website up and running in the shortest possible time. Responsive HTML5 CSS Grid is the perfect grid for beginners and more experienced developers looking for a simple grid to build a website quickly and easily. 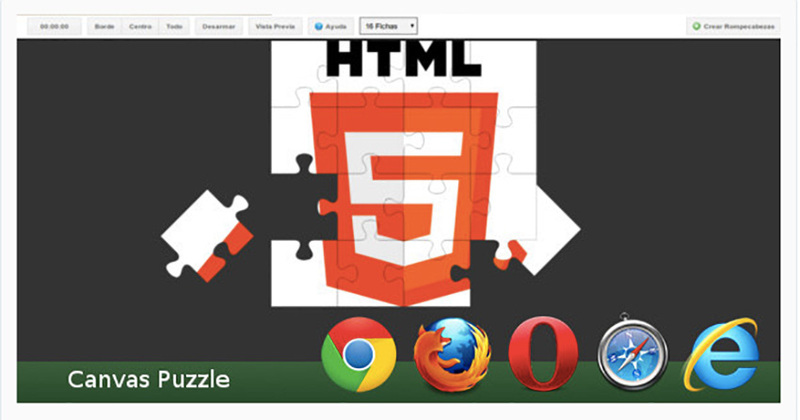 Canvas Puzzle is a neat HTML5 game that once installed allows users to upload images from their desktop to create puzzles of 16 to 100 pieces in size. Compatible with all modern browsers, Canvas Puzzle allows you to redirect visitors to another page, for example a signup page, once they’ve solved the puzzle. Like the Word Search game, Canvas Puzzle is another great way to keep visitors to your site engaged. There’s also a live preview that you simply must take for a test drive. You won’t regret it. If you have a website, you need a contact form, and you can’t go wrong with the ever popular Ultimate PHP, HTML5 & AJAX Contact Form. Easy to integrate into your PHP site, this contact form uses Cross Site Scripting (XSS) attack prevention and is Google reCAPTCHA capable. If you’re in the market for a contact form, then look no further than the Ultimate PHP, HTML5 & AJAX Contact Form. HTML5 Video and YouTube Background allows you to configure your videos as you like using a number of layouts, and customisable options. This HTML5 project comes with several demos for easy setup. HTML5 Video & YouTube background is an excellent choice if you want more control over how your YouTube videos look. These 10 popular HTML5 projects for you to use and study are by no means the only ones available at Envato Market. So if you haven’t found anything here that meets your needs, we have plenty of other great options on offer. And if you want to improve your HTML5 skills, check out our ever so useful free HTML5 tutorials.